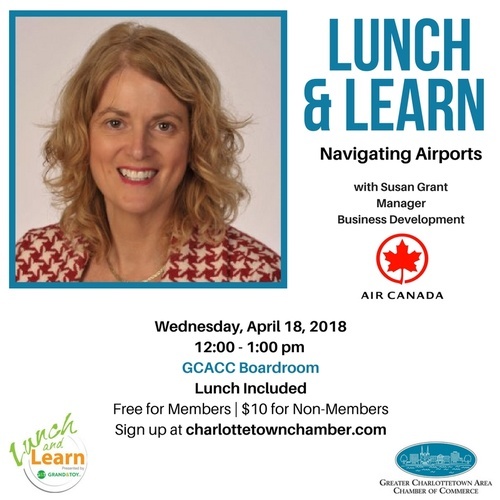 Lunch and Learn - "Navigating Airports"
Name: Lunch and Learn - "Navigating Airports"
Susan Grant has held many positions in her 27 years in the aviation industry. With her experience in Revenue Management, Network Planning and Business Development she brings knowledge of navigating airports, airplanes and airline value propositions. Susan has developed relationships with dozens of Atlantic Canadian companies small and large to bring value and support. Susan also represents Air Canada and the Air Canada Foundation at community events around Atlantic Canada. We are proud supporters of Chambers throughout the region, Junior Achievement Business Hall of Fame and the IWK Foundation as well as many other organizations focused on the health and wellbeing of Canadian youth. When she is not flying around Atlantic Canada meeting clients, Susan enjoys travelling the world for running tourism. She has completed a half marathon on all 7 continents, including Antarctica.